What I began as a review of Cynthia Kaufman’s Getting Past Capitalism has transformed into something both intellectually thrilling and personally significant. In this regard, Professor Kaufman’s text is a fantastic success. For anyone, like myself, with limited background knowledge of economic theory, Getting Past Capitalism will reveal the world, anew. Through her thoughtful yet accessible treatment of the titled subject, she explores the history of capitalism in tandem with practical solutions to be carried out in the anticapitalist struggle. But before we begin to question capitalism, Kaufman advises, we must understand what capitalism is; furthermore, we must know what it means to be and to act as an anticapitalist while living within the capitalist structure. Kaufman’s work immediately and aggressively condemns capitalism as an unnecessary evil masquerading as the final solution to a world full of seemingly contiguous economic and political challenges. Herein lies the text’s central charge—become familiar with the many pro-capitalist mythologies or memes to which we have been exposed throughout our lives and identify how we can personally come to rely less on capitalism and motivate others to do the same. In Kaufman’s view, those that seek to unseat capitalism though violent revolution and ousting of the ruling class have and will continue to be unsuccessful in the achievement of their vision. When government itself is the problem, it is “easily” overthrown. There is a distinct external enemy, which can be destroyed as quickly as the destructive decision-makers are removed. Capitalism—an economic system, rather than a government entity—is a far more sinister creature, existing not as a singular external body, but as a complex set of ideas and ideals woven into the social fabric and claiming dominion over not only our relationships with others or with property, but over our minds themselves. For that reason, Kaufman informs that freedom from capitalism can only be achieved by “unt[ying] the knots that bind us to it[,]” rather than by bringing down the house. Capitalism enables consumerism, which we have learned to associate with pleasure—the pleasure of earning a wage to purchase products for their monetary value, rather than utility. We display our brands as a peacock displays his feathers. We believe we will be perceived as socially relevant or sophisticated by making the right choice between one brand of cell phone or another, one t-shirt or another, by a particular handbag or pair of shoes. We accept the discord between “what we want as consumers and what we want as citizens of the world[. ]” We justify a purchase based on desire of the product without regard to the inhumane working conditions and or other exploitation of labor that made its production possible. All of this rings true, and yet numerous studies prove that wealth—or the ability to buy things—and happiness are not related. The pleasure provided by consumerism is largely artificial, formed as a desperate reaction to our otherwise colorless lives, wherein opportunities for artistic and intellectual expression are repressed and the concepts of “free time” or “work-life balance” are looked upon as childish, or even delinquent. Consumerism, an obvious “good” in any capitalist discourse, is likely more similar to a sugar addiction than it is a manifestation of public health and happiness. Professor Kaufman acknowledges that one of the greatest obstacles to overthrowing capitalism is its ostensible success as a short-term solution: when capitalists are making profits, jobs are available, and thus the worker has a means of survival. This prison of logic is precisely the kind of space the specter of capitalism prefers to haunt. The dependency of the working class on wages requires them to seek out and hold employment under the capitalist system that at once feeds and oppresses them. Coming to identify oneself as a victim or casualty of capitalism, rather than a beneficiary, forces us to look beyond earned wages for a measure of our personal wellbeing. The historically inaccurate perception that there is no possible alternative to capitalism is among the chief memes Kaufman sets out to rebuff. She describes existing non-capitalistic solutions carried out via Community Development Corporations (CDCs) that organize around community needs, as well as worker-owned cooperatives like the Mondragón network in Spain, which follow principles of self-management and social transformation described by Rick Owen, the utopian socialist, and practiced by mid 17th century model, the British Rochale cooperative. Kaufman also discusses examples of reform through the Zapatista movement of the 1990s and the Bolivian Movement for Socialism following the presidential election of Evo Morales in 2005. Kaufman suggests that another deceptive and powerful meme, the perceived relationship between democracy and capitalism, is illusory. She explains the connection to be smoke and mirrors, as an accident of their contemporaneous rise in the West, reinforced by the writings of John Locke and his successors, who conflated liberation and freedom of choice with the ability of owners and workers to “freely” contract for labor. Locke’s reasoning is riddled with assumptions about the equality of bargaining power between owners and labors. The false perception of a natural and rationally consistent partnership between democracy and capitalism can be refuted simply by listing some of the places wherein the two did not arise together, such as Iran, Chile, or Russia at different periods during the twentieth century. Kaufman proffers that the meme of democracy and capitalism as the doting parents of happy, healthy societies is similarly misguided. She poses the notion that from the tribes of the indigenous to the industrialized governments around the globe, healthy economies vary according to how individual communities are situated. Although Kaufman argues the merits of democratic franchise, she leaves open-ended the possibility that in some limited circumstances, people could thrive under non-capitalist economies, despite non-democratic forms of government. One of Kaufman’s primary themes is that the involvement or overthrow of the state is not necessary at the beginnings of anticapitalist action. She writes an extensive critique of Lenin’s adoption of totalizing views expressed by philosophers Karl Marx and G.W.F. Hegel. Instead she endorses lessened consumption, putting consumer or shareholder pressure on corporations to become environmentally accountable, local organizing around wage and hour requirements that improve quality of life, and other grassroots efforts. All of these projects pursue anticapitalism in ways that will be directly experienced with limited upheaval. The propagators of these anticapitalist movements, however small, must be sensitive to the possibility that people may look to their successes as examples that capitalism is working, since the overall system remains capitalistic. While being understanding of others’ emotional need to reproduce capitalism, the distinction of one’s work from mere reform is somewhat nuanced and best described by Kaufman, herself. Analysis of the effects of capitalism provides added clarity of the existence of human suffering, which is most often articulated exclusively through non-economic forms of tyranny, such as patriarchy or white supremacy. At its most transcendent moments, Getting Past Capitalism brings the problem that is capitalism to the doorstep of its readers, describing the intersectionality between capitalism and the other “isms” we discuss in formal settings (like conferences) and informal settings (over coffee). The pronouncement that the societal diseases of racism, sexism, heterosexism, ableism and sometimes nationalism can be better understood through an anticapitalist framing is key. The dependency on the wage, the reduction of the worker to a source of labor, and the alienation of the worker from his or her labor—these are the byproducts of a capitalist system that use the more visible forms of marginalization as subordination mechanisms through which cheap labor is made available and individuals are made justifiably expendable due to market fluctuation or when they become pregnant or disabled and are no longer “profitable” workers. Under capitalism, it makes sense to have a mass incarceration policy that strips rights and freedoms from an entire class of persons and puts them to work for what would otherwise be considered a slave wage. Under capitalism, it makes sense to deny maternity or paternity leave benefits, since capitalism does not consider family health or happiness, only the quantity of production. I recommend a careful reading of Getting Beyond Capitalism, but also continued reading and continued engagement in the work. Capitalism is not a “poor man’s” problem, as evinced by the text. Capitalism is everyone’s problem. Kaufman describes the lengths to which capitalism’s supporters will go to quash its opponents. Those who identify as anticapitalists or merely believe that certain anticapitalist projects could improve lives or enhance joy must therefore be prepared to delegitimize capitalism as it attempts to delegitimize all else. All concepts and quotes herein are attributable to or inspired by Getting Past Capitalism: History, Vison, Hope. 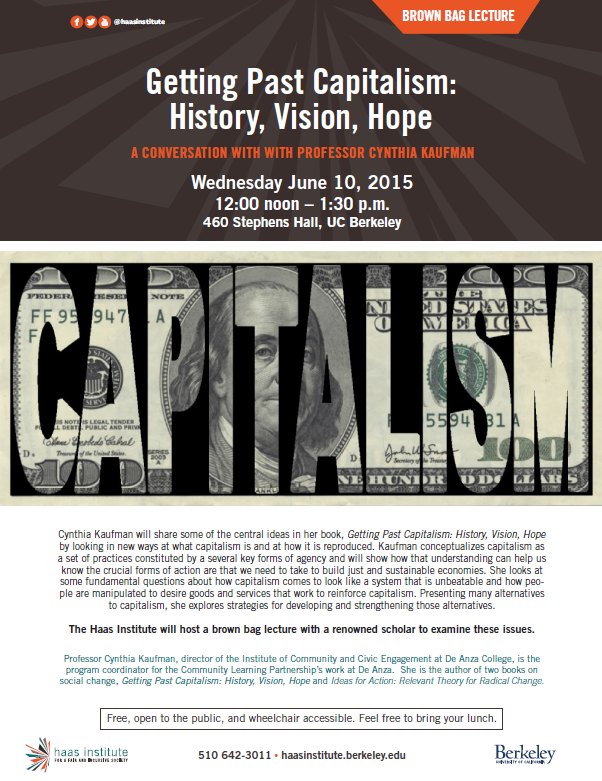 Cynthia Kaufman, Getting Past Capitalism: History, Vision, Hope (2013). Think of the value of a home-sewn winter coat versus a designer sports coat. Which has more value on a cold day?